A radioactive rabbit caught at Hanford just north of Richland had Washington State Department of Health workers looking for contaminated droppings Thursday. Contaminated animals occasionally are found at the nuclear reservation, but more often they are in the center of Hanford, far from town. The rabbit trapped at the 300 Area caught the Department of Health’s attention because it was close enough to the site’s boundaries to potentially come in contact with the public — such as if it had been caught by a dog or if its droppings were deposited in an area open to the public. It’s the Department of Health’s job to look for contamination off-site and make sure there is no public hazard. However, an afternoon of surveying turned up no contaminated droppings in areas accessible to the public, said Earl Fordham, the department’s regional director of the Office of Radiation Protection. Washington Closure Hanford, the Department of Energy contractor cleaning up Hanford in the 300 Area, found the contaminated rabbit droppings last week, said company spokesman Todd Nelson. Several rabbits have been trapped since then and one of them was found to be highly contaminated internally with radioactive cesium, Fordham said. Because the number of contaminated droppings being discovered on-site has decreased, officials believe it’s possible that just one rabbit might have been contaminated and they now are finding old droppings from it. Washington Closure has narrowed the area of possible contamination to the 327 Building. It was used during the Cold War for testing highly radioactive materials, particularly fuel elements and cladding that were irradiated at Hanford reactors as part of plutonium production for the nation’s nuclear weapons program. The above-ground hot cells were pulled out of the building and demolition began on the structure about a month ago. One theory is that the rabbit might have been sipping water that collected in the building’s basement after water was sprayed during demolition to suppress dust. Washington Closure has taken steps to keep other animals from getting near the building. Workers have put up a chain-link fence and removed any vegetation that might provide a rabbit snack. They also scented the perimeter of the building with fox urine to deter animals that might burrow and get closer to any contamination. Gravel and steel plates have been used to cover places that have been identified as potential sources of the contamination. Department of Health workers were using handheld instruments to search for radioactive droppings on Thursday, looking for “polite rabbits,” Fordham said. Rabbit droppings are more likely to be found hidden under bushes than out in the open, such as on roads that the public can drive on north of Richland. The farthest droppings have been found from the 327 Building is about 100 yards to the south, which still is within an area closed to the public. Hanford has an extensive program to check for contaminated animals. In 2009, 33 contaminated animals or animal materials such as droppings were found on the site. In Hanford’s earlier years, contaminated animals were more common. Liquid waste with radioactive salts was discharged into the ground near central Hanford during the Cold War. 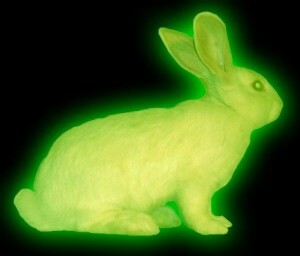 Rabbits and other animals were attracted to the salts and spread radioactive droppings across as much as 13.7 square miles of sage-covered land before the waste sites were sealed to keep out animals in 1969. Federal economic stimulus money has been used to survey for the radioactive hot spots that remain four decades later. In a more recent case, so many radioactive wasp nests were found spread across six acres by H Reactor in northern Hanford that up to a foot of soil was dug up to remove the nests. The nests were built by mud dauber wasps in 2003. Water was sprayed to control dust during demolition of a basin attached to the reactor, and the mud created was collected by the wasps to build nests under straw that had been spread nearby to protect newly planted sagebrush seedlings. There have been a couple of cases in the past two decades of contaminated animals in areas where they potentially could come in contact with the public. In 1996, a contaminated mouse apparently crawled into a box of food collected by an employee food drive in central Hanford. It was trapped and tested in an abandoned Hanford building previously used by the Tri-Cities Food Bank. Two years later, gnats and flies were suspected of eating a sugary coating used to fix some radioactive contamination. They then spread the contamination to waste left by workers in offices, such as banana peels and apple cores. That required 35 tons of trash that could contain the office waste to be dug up from the Richland landfill and returned to Hanford. Posted on 11.05.10	to articles. Subscribe to follow comments on this post. No comments yet. Add your thoughts or trackback from your own site.